UTTER DEVASTATION: In this photo, provided by the TT Coast Guard and uploaded to social media Facebook, people walk through debris which covers a road in Dominica which was struck by Category 5 Hurricane Maria. 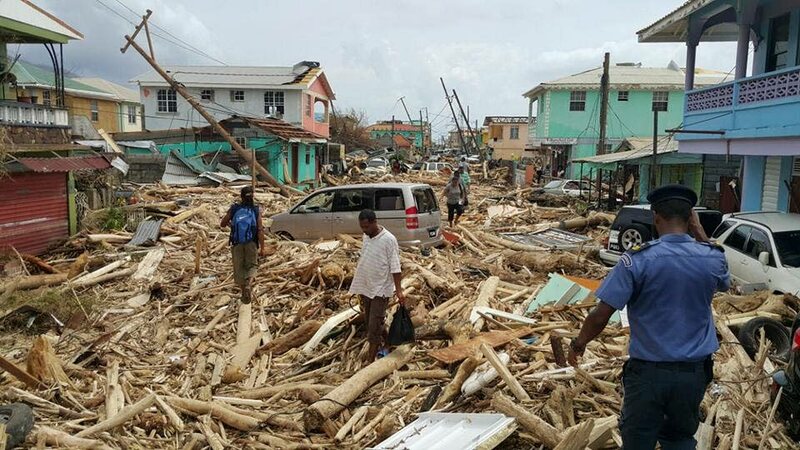 The US$2 billion pledged at the Caricom-UN Conference for long-term recovery for hurricane-affected countries and the establishment of the regional renewable energy centre are among successes Caricom recorded for 2017 in spite of many challenges. This is according to Secretary-General Ambassador Irwin LaRocque in his end-of-year message. Other noteworthy achievements include a change in posture by international financial institutions (IFI) and some development partners with respect to access to concessionary development financing. It was encouraging to note, he said, that Caricom’s relentless advocacy on the lack of access to concessional development financing appears to be bearing fruit. There is some re-thinking on this issue taking place at the level of the IFIs and some international development partners. Another achievement was the endorsement in July by heads of government of the Human Resource Development 2030 Strategy. The strategy is intended to prepare Caricom to address the requirements of its 21st-century economies and society through actions for basic education, from early childhood to tertiary and life-long learning. On energy, he noted that in July, member states signed the agreement establishing the Caribbean Centre for Renewable Energy and Energy Efficiency. The Barbados-based centre is the implementation hub for sustainable energy activities and projects in the region. It is expected to play a major role in increasing renewable energy shares in power generation to 47 per cent by 2027 while lowering of costs to consumers with benefits to the environment. LaRocque noted the opportunities now opened to the private sector with the signing of the Second Protocol to the Caricom-Cuba Trade and Economic Cooperation Agreement. This protocol allows for duty free access to Cuba for Caricom producers of some 300 items including meat, fish, dairy produce, fruits and vegetables, beer, rum, cement, soaps, articles of apparel and clothing. Carifesta XIII in Barbados under the theme “Asserting our Culture: Celebrating Ourselves,” he said, was another success of 2017. “The business aspect of the creative industries took centre stage in keeping with the heads of government endorsement for exploring the potential of the cultural and creative industries to contribute to the economic development of the region,” he stated. in 2018, La Rocque is looking forward to closer regional unity, reminiscent of the kindred spirit that fueled the outpouring of support post hurricanes Irma and Maria. He commended the Caribbean Disaster Emergency Management Agency (CDEMA) and the Caribbean Catastrophe Risk Insurance Facility (CCRIF) for performing their respective roles “magnificently” and promptly in the aftermath of the hurricanes that ravaged the economies of some Caricom members. He also commended the “yeoman support” provided to the hurricane-stricken countries by Caricom governments, the people, institutions and the international community. Reply to "SG: Caricom achieved despite challenges"